Spending too much money on app customization and development? Here’s a tip on how to save some! One of the crucial push notifications features is the ability to deep link your users to a specific section of your app, to avoid wasting their time in the search of the particular piece of information. If a message thread gets updated, you should not land your readers on What’s New or Contacts page. If your favorite football club scores, you don’t want to dig through the list of the rivals on your way. Your readers or players want to feel loved and assured that due care was taken here. One might argue it adds hours and hours of development to achieve such extensive customization. Pushwoosh to the Rescue! Deep Linking has just become more intuitive, Plug and Play style. Here you can find our new guide on Deep Linking for both iOS and Android. Just show this cheat sheet to your engineers, and get your app up and running in no time. Once everything is set up, all you have to do is send a push with the key to your target location in the new Actions tab. If you would like to continue doing it old school style, feel free to opt for the Custom Data to be attached to your message. 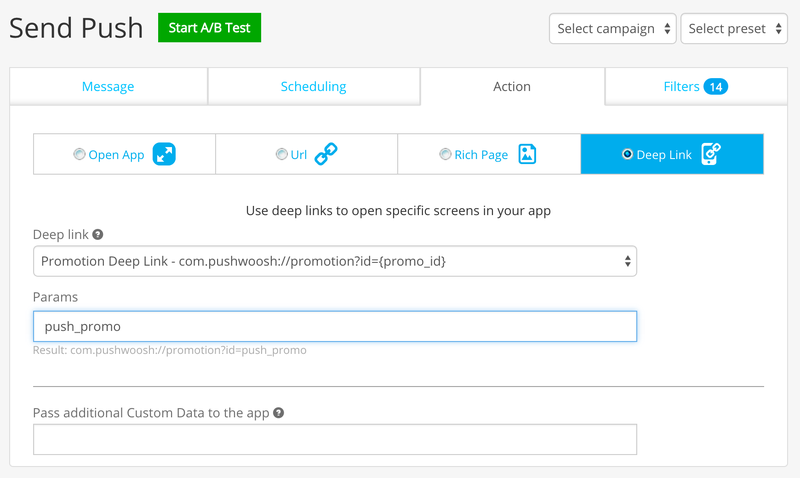 Let us know if you like your new Deep Linking capabilities, or want to see something new in the next updates!